D-1 sensors are suitable for measuring the concentrations of the following gases: hydrogen, deuterium, hydrogen sulphide, nitrogen dioxide, ethylmercaptan, chlorine and ammonia. 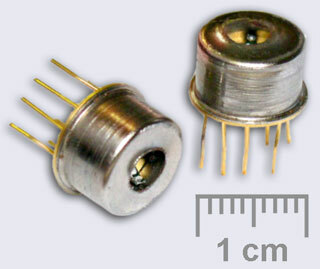 The basis of the sensor is MIS (metal-insulator-semiconductor) - structure Pd-Ta2O5-SiO2-Si, which capacitance changes when reaction with gases occures. The sensor fabrication technology is based on the microelectronics device fabrication technologies and the thin film laser deposition technique. Sensor can be used for measuring the concentration of any gas among noted before, in ambient temperature range –30..+40°С and RH 30 до 90% (30°С). * - in case of pulse heated sensor in gas analyser when the temperature cyclically changes between working temperature 100ºС and 190ºС. Signal is measured when the sensor cools to 100ºС.